The Nokia 6760 Slide is almost identical to the new Surge handset available on AT&T in the US, except that the 6760 is an unbranded device for worldwide use.. and for some reason it comes with a better camera. 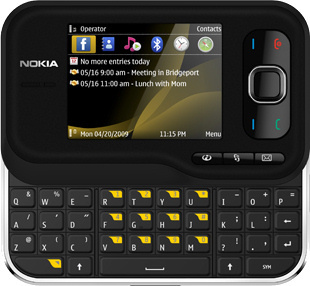 This is really just a cut-down version of the E75, and if you ignore the slide-out QWERTY keyboard, then the 6760 is a pretty simple 3G phone underneath. There's a standard 2.4" 320 x 240 pixel display, 3.5G support, a 3.2 megapixel camera, Bluetooth and microSD expandable memory (with 2GB in the standard sales package and 8GB maximum). The Nokia 6760 Slide also supports GPS and comes with Nokia Maps. The small screen is not ideal for in-car navigation, but it's still a useful thing to have in your pocket. Because this is a Symbian S60 smartphone, there are a variety of applications available. Some of the built-in features include support for major social networking sites, instant messaging and the 6760 supports both standard email formats and Microsoft Exchange push email services. As with most similar Nokia phones, the 6760 Slide comes with pretty decent multimedia capabilities plus an FM radio, although annoyingly it comes with a 2.5mm audio jack rather than a 3.5mm one. The camera is a little disappointing - the 3.2 megapixel unit is fixed focus and lacks a flash, and the maximum video capture rate is only 320 x 240 pixels at 15 frames per second. Unlike the Surge, this has 900 MHz and 2100 MHz 3G support plus quad-band GSM. 3.5G data is supported, giving a maximum download speed of up to 3.6 Mbps, but it does not support WiFi. The 6760 weighs 124 grams, measures 98 x 58 x 16mm and has a maximum talktime of 4 hours on 3G. The Nokia 6760 Slide certainly isn't to everyone's tastes, although it looks a bit more exciting in the red and white colour combinations that will be available instead of black. But people who are looking for a fairly low cost but versatile messaging device may well be tempted. 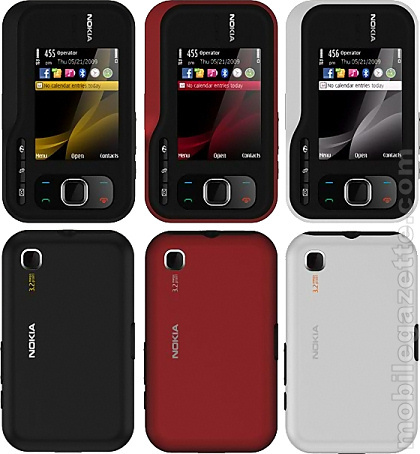 Nokia say that the 6760 Slide should be available from Q3 2009 at an estimated price of €199 before tax and subsidy.